To make sure customers are able to safely use our gas equipment and appliances, we conduct thorough, legally mandated periodic safety inspections of gas equipment and provide customers and appliance manufacturer information and training on safe use from the perspective of hardware and software. In response to the revised Consumer Product Safety Act, which came into force in May 2007, we drew up the Voluntary Action Plan of Tokyo Gas Concerning Product Safety as a company that repairs, installs and sells residential gas appliances, with the intention of ensuring product safety and fostering a culture of product safety. Under the plan, we strive to ensure and improve safety to meet social demands and expectations. Moreover, in our drive to promote a culture of gas appliance safety, we post important notices on the use of residential gas appliances on our website to enable customers to find accurate information quickly on the correct use of our products as well as recalls and reported problems. The entire Tokyo Gas Group is committed to acting quickly and effectively in order to ensure safety and improve the quality of gas appliances under our three pillars of safety, security, and reliability. Tokyo Gas defines the following Voluntary Action Plans to ensure product safety and establish a culture of product safety, thereby strengthening our group values of “Safety, Security, and Reliability” in our role as a company that sells, repairs and installs home gas appliances. We shall comply with laws and regulations concerning product safety, formulate in-house voluntary standards for repair and installation work, and strive to ensure product safety. We shall improve our company’s product safety promotion system to ensure product safety. We shall contribute to reducing the risk of product-related accidents by sending feedback on product-related accidents and problems that come to our attention to the manufacturers and importers of gas appliances. Whenever we learn of a product-related accident we will promptly forward the information to senior management and related departments in the company, as well as to manufacturers and import companies. We shall promote awareness and disseminate information to our customers on the proper use of gas products, follow-up on questions from customers on product safety and commit to the cultivation of a culture of product safety. Whenever manufacturers or importers recover products due to recalls or other reasons, we shall cooperate with them to efficiently facilitate product recovery. We address gas appliance failures or accidents at a section dedicated to quality in order to quickly identify the causes and determine effective responses. A new section was created in April 2011 to strengthen these efforts. In the event of any gas appliance accident or gas appliance failure that requires the identification of a technical cause, we strive to ease customer concerns by immediately investigating the cause and taking the necessary actions in cooperation with manufacturers. We share the results of any investigations of gas appliance failures along with the expertise gained through the analysis of past repair data with other gas utilities and gas appliance manufacturers to prevent similar failures in new products and improve product quality. As an example of success of these efforts, all balanced-flue bath boilers have been equipped since April 1, 2011, with safety devices to prevent irregular ignition caused by improper handling and also prevent the boiler from being left on. Some models remind the user through an alert light or error message on a remote control to have the equipment undergo a checkup when its use exceeds its design life. This is another example of our ongoing efforts to advance safety measures. To improve the safety of gas kitchen stoves, the gas industry, including gas suppliers and gas appliance manufacturers and sellers, enforced self-regulating standards that require the installation of safety devices on all burners of residential gas kitchen stoves manufactured in April 2008 and later, except single-burner tabletop stoves. Every applicable burner must be fitted with sensors to prevent overheating of cooking oil and to detect flame failure and device to shut off after certain amount of time. The industry refers to these kitchen stoves as Si-sensor-equipped cooking stoves to raise public awareness of kitchen stove safety. Japan’s revised Gas Business Act, which came into force in October 2008, mandates overheating prevention sensors and flame control devices. In March 2008, before the application of industry standards and revision of the law, Tokyo Gas required that all kitchen stoves sold by the company, except single-burner tabletop units, be Si-sensor-equipped cooking stoves and achieved cumulative sales of 1.75 million units*1 by the end of March 2018. Recent high-end models have more advanced safety features, such as pan detection that automatically lowers the flame when a pan is removed from the burner. *1 Excluding single-burner tabletop stoves. We develop home-use combination alarms for fire, gas and carbon monoxide detection as well as home-use fire alarms so that customers can use gas safely and securely. Since 1999 we have been selling combination alarms, which detect a fire, gas leak or carbon dioxide from incomplete combustion and give out warning sounds and messages. We are also broadening our lineup of alarms. In February 2010, we launched an indoor fire alarm powered by a battery with a life of 10 years and also launched a system of wirelessly networked fire alarms, in which activation of one alarm sets off the other alarms. Research and development into low-power gas sensors began in 2006, and in October 2015 we launched a residential, battery-operated gas and carbon monoxide alarm with ultra-low power consumption. 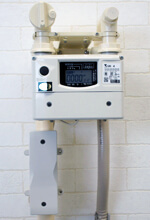 Residential gas meters that measure customer gas consumption and monitor gas usage are called microcontroller meters*2. We jointly develop ultrasonic gas meters with Osaka Gas Co., Ltd., Toho Gas Co., Ltd. and appliance makers. These meters use ultrasonic sensors to measure gas flow and are utilized as microcontroller meters primarily for household use. Since ultrasonic gas meters have a simple structure with no mechanical moving parts, they are much lighter than conventional diaphragm gas meters, or about one-third the volume and half the weight, while performing the same functions. Therefore, they have a better appearance and offer users more leeway in deciding where to locate them. We developed a PHS communications device that works for at least 10 years on three lithium batteries (2,400 mAh, 3V) as a wide-area wireless communications device for our Residential Monitoring Services, which serves as a remote gas shut-off and monitoring service for household customers. Using PHS devices enables us to provide stable services without relying on customer fixed-line telephone connection. Additionally, we are currently considering using a next-generation LTE wide-area communications device. 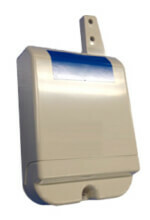 We launched a first-generation ultrasonic gas meter with communications and conventional safety capabilities in July 2005 and a second-generation model with a more advanced communications capability at the end of 2010. A pilot third-generation model made at significantly lower cost was introduced in the second half of fiscal 2016 and adopted officially in the second half of fiscal 2017. As a result, about 850,000 ultrasonic gas meters were in use as of the end of March 2017. In addition, about 200,000 PHS communication devices, which were first installed in December 2012, were in use as of the end of March 2017. Under our plan to install smart meters for all household customers, we are developing technologies to increase added values while reducing the costs of the meters, communications devices and installation. The Introduction of smart meters will provide more precise services based on measured data in addition to improving operational efficiency. 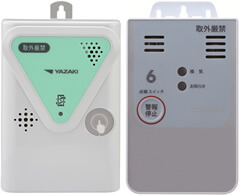 Along with Osaka Gas Co., Ltd., Toho Gas Co., Ltd. and appliance makers, we are jointly developing a multi-hop relay device for connecting residential gas meter readings and other data via multiple gas meters. The device applies intermittent rather than continuous transmission, sending and receiving signals every five seconds to save power consumption, and operating for 10 years despite being battery-powered. Current wireless devices allow transmission only within an area that can be served by radio waves and are only usable in buildings of up to five stories, within the reach of radio waves transmitted by ground-based meter checkers. They also require long transmission times. The new device, capable of multi-hop relays, allows wirelessly checking meters in commercial buildings and condominiums six or more stories high. We started using the new devices to check gas meters at our corporate housing for employees in May 2014. In April 2017, the devices were incorporated into our My Tsuho notification service for owners of apartment houses and condominiums. The devices reliably collect gas meter readings and other data even at houses where PHS reception signals are weak. Moreover, they allow us to provide the service at large apartment houses and condominiums. We have been encouraging the switchover to safer appliances since January 2007. We recommend by direct mail or on the occasion of periodic safety inspections of gas equipment that customers who use water heaters or bath boilers not equipped with devices to prevent incomplete combustion to replace them with safer equipment as soon as possible. In fiscal 2017, we continued to promote the replacement of such appliances—small water heaters, wire mesh stoves, conventional flue-type water heaters and bath boilers, and forced exhaust-type water heaters (with downdraft diverters). This has helped to bring down the number of such appliances in our service area from about 160,000 at the start of the replacement campaign to 16,809 at the end of March 2018. We will continue supporting this effort and steadily work to improve safety so that customers can safely use gas appliances. To ensure the safe, comfortable use of commercial gas appliances in locations such as restaurant kitchens, we recommend the replacement of old-type gas outlets and rubber tubes and the installation of gas alarms and automatic gas shut-off devices. Since November 2006, we have installed commercial ventilation alarms free of charge to prevent carbon monoxide poisoning accidents, targeting about 180,000 restaurants and other facilities that use gas appliances in commercial kitchens. A cumulative total of 500,000 units have been installed as of August 2017. (Customers using commercial-grade gas equipment are eligible for free installation.) The alarms are replaced with new ones before the expiration of their six-year certification. *1 Data in fiscal 2009 and earlier are estimates. *2 Numbers as of the end of March each year.